Story and Photos by Libor Pospisil. The walk toward the now-famous house was supposed to be just my early morning stretch. I left the place where my friends and I were staying in the Roma Norte neighborhood of Mexico City and headed for Roma Sur. I was off to see the city’s new pilgrimage spot: the house where the Oscar-nominated Roma film was shot. While I had seen the movie before our four-day trip to Mexico, I had not planned for the trip to be Roma film themed. Rather, we were there to see a few sights, enjoy several of the city’s neighborhoods, and taste Mexican food and drinks. Only after I left Mexico did I realize that the house was not the sole Roma film related location that I encountered in the city. In fact, the movie tells the story of the entire city and how it came to be the bustling metropolis it is today. Taking a page from Anthony Bourdain: “Travel is not reward for working, it’s education for living.” For me, who had never visited the Yucatán, my notions of luxury beach resorts or dense jungles filled with vine-encrusted Mayan pyramids and relics of lost civilizations needed some travel-education. As I found out, neither notion was completely correct and there is a lot more than just archeology and beaches in the Yucatán. My wife and I opted for a wide-ranging Yucatán immersion cruise-safari offered by Victory cruise line. Our Yucatán outreach safari took us from the Caribbean in the east across the full width of the Yucatán peninsula to the Gulf of Mexico in the west. Once accessible only by sea, Mexico’s Yucatán is a place steeped in history. Here, both Mayan traditions and modern life flourish peacefully in a setting of architectural and natural beauty. Some of the most wonderful ways to experience the true Yucatan are to stay at a traditional inn, spend time with a Mayan shaman, swim in a cenote, visit a hacienda, explore ancient ruins and dine on Mayan and Mexican cuisine in a candle lighted cave. My spouse and I have just returned from a eight day intensive exploration of the highlights of an upcoming land/sea voyage with Victory Cruise Lines, colloquially dubbed the “thinking person’s cruise choice.” Our Yucatán outreach safari stretched from the Caribbean coast in the east to the Gulf of Mexico in the west in this first of the cruise line’s five land and sea forays into Mexico’s Yucatán Peninsula. Story and Photos by Robert W. Bone. MAZATLÁN – Life moves smoothly along the shores of this Pacific coast town. Sunbathers take their cue from the pelicans lazily coasting along inches above the waves. This “Golden Zone,” as it is called, is not much different from a resort beach anywhere in the world. But visitors who rouse themselves from the sand to take a trip to the city center find something very different. 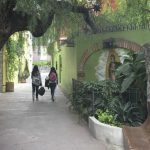 There, among the pastel-colored buildings, narrow streets and shaded plazas, is a Mazatlán that still has the atmosphere of a Spanish colonial town. One ancient square in particular evokes a compelling story of triumph and tragedy which took place a century and a quarter ago. Story and photos by Lee Daley. For a soul soothing stay in San Miguel de Allende, Hotel Matilda, the “hotel different,” is an eye-opener. When you travel to a Mexican colonial city that has been designated a World Heritage Site, you might expect to stay in a well-preserved restored mansion turned hotel. And, in San Miguel, you would have your choice of some of Mexico’s finest examples of Baroque and Neoclassical architecture.The city’s historic center is filled with buildings from the 17th and 18th centuries, many lovingly restored. The magic of the holiday season in Mexico begins the eve of December 12 with candlelight processions all over the nation in honor of the Virgin of Guadalupe, patron saint of Mexico. In Barra de Potosi, a tiny fishing village on Mexicoʼs Pacific coast, the entire population turns out to honor La Guadalupana. They do the same 20 minutes north in the larger fishing-village-turned-coastal resort of Zihuatanejo, and in every village, town and city throughout the nation. El Profe puts the hamlet of Coacoyul on the map every Thursday afternoon from 2 p.m. when the restaurant opens to serve pozole, the hearty hominy-based soup that is the weekly culinary tradition in much of Mexico, especially in the state of Guerrero. Story and Photos by Stephanie Levin. Snippets of independent, quiet conversations from our little band of hikers erupted as an umbrella of oak trees narrowed to a dirt trail that ascended, descended, twisted and ascended again before leveling out. I had signed on for the pre-dawn two-mile hike up to La Cocina Que Canta, translated as “The Kitchen That Sings,” Rancho La Puerta’s organic garden and cooking school. I’d never actually hiked anywhere before the sun came up; in fact, I don’t like to get up before sunrise, but the opportunity to enjoy breakfast at La Cocina Que Canta with ingredients from the renown organic garden was too irresistible to pass up. As the hike progressed, the serenity, the crunch of our shoes on the dirt, the aroma of sages, salvias and shrubs peaked my senses. I scanned the eastern sky as the sunrise yawned awake. Oaxaca’s appeal is so fundamental it’s a wonder this southern state of Mexico and its mile-high capital, Oaxaca [pronounced wah-HA-ka] City, are not more traveled. Blessed with year-round temperate climate, nearby archeological ruins, distinctive cuisine and magnificent artisan handicrafts, the 16th century settlement nestles in a temperate highland valley and enjoys year-round abundant sunshine. Oaxaca’s zocalo, its central open-air plaza, radiates the warmth of its people. Amid a hubbub of surrounding bustle there is a friendly welcoming calm. Approaching Punta de Mita on a bright fall day, the flawless sky a cerulean blue, I knew I was in for something special. The warm breeze felt like a caress; its clarity etched the curves of the Sierra Madre Mountains creating an epic backdrop to the famed Bay of Banderas and the valley below.